Well, here it is, the end of March already. Can you believe it? That means I have another stash pattern to share today. I'm calling it Easy as Pie. I love the vintage vibe it has. It measures 58" x 70". This was my initial fabric pull. I started with about 18 different fabrics, and edited a few out as I went (due to color), and added in a few more. So I would guess there are about 20+ different fabrics in all. There are two approaches to the assembly. The first way is to layout all the blocks at once, making sure that each block is in a specific spot. The second way is to randomly sew rectangles together to make the rows. Once all the rows are sewn together, they are arranged. This is a much more random approach, but somehow it always seems to work out in the end-especially if you have a large variety of fabrics. Either way, the rows will be constructed the same way. Sew 11 rectangles together, side by side. You will be sewing the 7 1/2" sides together, so the rectangles will be standing on end. Add a half rectangle to each row. Make 10 rows. In every other row, the half rectangle will be the starting block. In the alternating rows, the half rectangle will be the ending block. Sew all 10 rows together, making sure to press the seams well. Quilt, baste and bind as desired. If you use this pattern to decrease your stash, I'd love to see it! Convoy of Hope is a faith-based organization with a driving passion to feed the world through children's feeding initiatives, community outreaches, disaster response and partner resourcing. I first heard about this organization through my church. They feed millions of kids per week around the world. When I saw the videos of kids that are benefiting from the work of this organization, it was both touching and heartbreaking. I heard that they were one of the first organizations to show up in Japan to help with the recent devistation. Their work there still continues, as you can imagine. I spent the better part of yesterday morning listing my Flea Market Fancy fabric on ebay. I've never sold a thing on ebay, so I have/had no idea if anyone will even buy it. But, I have a lot of fabric and it's just been sitting here. In the big scheme of things, it seems silly, doesn't it? I've decided to sell it, with all the proceeds going straight to Convoy of Hope. It's the least I can do. I have kids that have full tummies every night. I can't imagine it any other way. a few specifics...there are 23 different listings for flea market fancy so I'm not going to link to them...but if you do a search for "flea market fancy fabric" you should find them. (My user name is crazymomquiltsaj.) edited to add: you can find all the listings here. I also listed a half yard of Heather Ross' camper vans in blue here. I left the auctions open for 5 days, so sometime this weekend the auctions will close. (I really can't pinpoint their timing system, it makes my head hurt trying to figure it out, so that's as specific as I can get.) If you feel so inclined to bid, I sure would appreciate it. I haven't understood all the dresden plate hype....until today. It was my intention to make a dresden plate pin cushion. I made my own template for the pedals and jumped right in. My dresden ended up about 7.5" across. It's waaaay too big for a pin cushion, but will make a great pillow instead. It's definitely not the worst thing to happen. You can bet that I will be trying again! to make some pretty quilt blocks. When I started, I had a fuzzy idea of where I was headed. After playing with them, I know right where I'm headed....straight to the fabric store to buy more Kona. :) I can't wait to see this one come together. I've been quilting for over 10 years now, and I'm amazed at how much I still don't know. Ok, let me rephrase that. I am amazed at how many things I keep learning. I'm not complaining....it's awesome! I've been wanting to share a few links that have been helpful to me. First off, Carol wrote a great tutorial on single fold binding. I saw this tutorial, tried it and loved it immediately. I wouldn't use it for quilts, but for coasters, mini quilts, etc, it's perfect. She calls for cutting the binding 1 1/4'' wide, but I used a honey bun strip (which is pre-cut at 1 1/2'' wide) for this little coaster and it worked great. In fact, I think that it's the best use of a honey bun that I've come across to date! Secondly, Anita did a wonderful tutorial on machine sewn binding. After reading her tutorial, I started thinking it was actually feasible for me to bind quilts this way. I was very scared to try it (it took me 6 months), but really, I didn't know how painless (and QUICK) it would be. I used the technique on this quilt, and I will definitely try it again. I'm just delving into hand quilting, and this video on how to make a knot is awesome. I mean, I know how to make knots in my thread all too well. But this video helped me to learn how to be intentional in where the knots end up. :) This helped me a ton when I was working on all my applique leaves, too. (I just finished them this afternoon!!! YAY!) There is also a great video on tying off, or making an ending knot. Super duper helpful! Lastly, I am sooooooooooooooo excited, because my husband gave the the go ahead to go to this retreat! I met Penny at a retreat last November and her work is amazing! In fact, it was after seeing her paper piece at the retreat that I was inspired to re-work my band aid block idea into something a little more realistic. It was fun and this is something that I've been wanting to do more of. When I was a kid, when we had to pick rocks, (which was NOBODY'S favorite job) my dad would try to encourage us to keep going strong until the end. When we turned the last corner he would often announce, "This is the home stretch". Those were always welcome words to hear, let me tell you! I'm feeling that way with this quilt. I'm so excited to be on the home stretch. Only 25 more leaves to go! I do love this project. I've learned a TON about applique by just jumping in and doing it. But I am so ready to start assembling it into a quilt top. On the flip side, I'm already looking for my next applique project. I love this one that Nicolette is working on, but it's WAY more ambitious than I am looking for. Any ideas? The winners of the Tour Ireland books are Punkie Pie (Jen) and Frances! Please email me your addresses. Thanks to everyone for playing along! To be honest with you, this isn't a day that I normally do a ton of celebrating, but I'm not opposed to it. 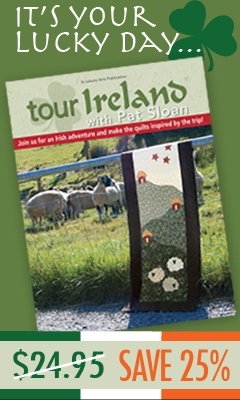 :) Pat Sloan is doing a blog hop to feature her Tour Ireland book, and I'm happy to be joining in the fun. Tour Ireland is a book that documents Pat's trip to Ireland with a group of quilters. There are lots of gorgeous photos of Ireland included. (I want to go!) It's like a scrapbook and a pattern book rolled into one. It has some great patterns that I would love to make, scrappy style, of course. This one is called Sheep's Feet. I think it's so clever. It's made from snowball blocks that alternate lights and darks. I don't think I've ever seen that before, and it makes the quilt quite interesting. I just had to start one right away. I can already tell that I'm gonna love it. Pat is offering her book at 25% off the regular price through the end of March. You can buy it here. Or...you could stop at any of the places on the blog hop and try to win a copy for yourself! Of course, you could leave me a comment here, too. In your comment I'd love to know if/how you celebrate St. Patrick's Day. I'll be picking two winners from this post that will each recieve a book compliments of Pat and Leisure Arts. I'll pick the winners on Saturday. Hope you have a GREAT day! I started this quilt last Friday, on a whim, and I pulled it out of the dryer yesterday afternoon. It was such a quick project that it never made it to the in progress list. I'm not complaining one bit! That list needs some serious slimming down. And soon! And this is the back. I was worried about the color palette being a bit too broad, but it worked out just fine in the end. Phew! It's quilted as it's made and it's not bound. Once it is assembled and the edges are clipped, all you have to do is wash and dry it. Easy enough! I have to admit, I went into this quilt having my doubts. But I'm pleased as punch with the results. And after. :) It has such a great texture and weight. This is a different color palette than my normal, so it actually matches my house quite nicely. Hurray for that!!! ﻿My daughter did a quick test run for nap-worthiness. I think it's gonna work just fine! This quilt is an instant favorite with my kids. Yay! I really, really like it, too! It measures approximately 48" x 60". The process is messy! I used charm packs, which tend to shed a lot in the first place, then there was the clipping. There was a dust bunny fest in my craft room. It may have needed cleaning before, but definitely after! The quilt wasn't all that impressive during the process. It took on a whole new life after washing and drying. The best batting to use inside the squares is warm and natural or warm and white. The few 80/20 scraps I had were too puffy. The charm squares tended to shift a lot more than with the thinner batting. Assembling the blocks was not my favorite part. I found it hard to sew very close but not over the layers of batting. The bulk of the batting kept pushing my walking foot to the side. I just did the best I could and tried not to stress over it. Even after washing and drying, this quilt is still shedding. I'm fairly certain that will settle down after a bit. Here's hoping! I'm taking a stab at making (my first ever) rag quilt. It was that or make about 200 coasters. Ha! This quilt has made my 8 year old son very, very happy. He has been waiting an awfully long time for it to be completed. I started this quilt because I wrote a tutorial for the flock block for Quiltivate and I just loved it, so I made enough blocks to make an entire quilt top. The blocks themselves only made a quilt 48" square, so I added a few pieced borders to make it larger. I love the traditionally pieced blocks (pinwheels included) mixed with the improvisationally pieced string borders. I also LOVE the color scheme so very much. It finishes at about 60", and it's almost square. ;) It's a great lap size for my little guy. I used Fairfield 80/20 batting, which has more loft than my normal warm and white batting. The extra loft threw me for a loop, so I had to rip stitches (less than a bobbin's worth), rebaste (oh, it was painful!) and then quilt again. It was worth it, because I was able to quilt it without puckers the second time around. Phew! This is the first time I attempted machine binding both sides on a quilt this size. I was still quilting it after supper, but I had it done-binding and all-by bedtime. Woo-hoo! What a quick result! I really like the look of the top stitching on the front. It looks so finished and tidy...at least in most places. I attached the binding on to the back of the quilt, then top stitched it on the front. I began by pinning the binding on 2 sides. I pricked my fingers way too many times, so on the final two sides I just folded the binding over as I went, without pins, and it worked about as well. It was much less painful! I did pin each corner, though, because I didn't want to mess those up. I'm pleased with my first attempt at this technique! I was planning on binding this with Kona charcoal, but my boy picked out this little bird fabric for binding instead. I think it's a far better choice. It ties all the colors of the front and the back together. I like how it adds a bit of fun and whimsy to the quilt. I couldn't choose just one perfect backing, so I went with a pieced back instead. I was telling some friends last night that if I knew how much I would love this quilt I don't know if I would have promised it to my son. I'm such a great mama, huh? No, really, I'm glad it's his and that he loves it so much. Please email me your mailing info so I can send out your free fabric to you. The fine folks at Connecting Threads saw my post awhile back, and as a thank you sent me some of their Essential PRO Thread. I was shocked that they had seen my post, and even further amazed that they sent me some thread as a thank you. What a pleasant surprise! They also sent me some fabric to pass along to my readers. I have 3 stacks (similar to a layer cake) of Sweet Remembrance fabric to give away. So you know the drill, if you would like to win a stack, leave me a comment here. I'll pick 3 separate winners sometime next week. I made myself a new little pincushion the other day. I absolutely LOVE it! and itty bitty scraps. Not a bit of those precious bliss dots gets thrown out at my house! Pattern can be found in this book. When I make something this cute, why do I have to urge to make 100? or 1000? The winner of Amy's Modern Basics book is Christy. Christy, please send me your info so we can get the book to you!